In the rolling countryside of western Wales, there is another breeder with whom I had a wonderful time getting to know. She is Susan Murphy, a humorous lady with a passion for animals. She has living on her 200 acre farm not only horses, and cows, but chickens, peacocks, numerous dogs and many cats too. I think Susan has a heart as big as Texas as she seems to rescue many creatures from fates undesired. They all thrive under her care. Susan Murphy has been involved with Arabians for many years although she originally started with Thoroughbreds. “I breed what I like,” she stated when I asked about her breeding program. Susan goes by what her eye tells her, not locking herself to pedigrees, show winners or what is in vogue. She does pay a lot of attention to the show scene, and what other breeders are breeding, but her method is entirely her own. When she first got involved with Arabians she had purchased a Stargaard mare (Star Diamond x Somara). She bred her to Donax (Ludrex x Dargemet by Dargee), got a filly, however the mare died foaling. Not to stop her progress, she borrowed two mares from Dr. Houtappel. They were Jordanian. One was RAJHA, by Bahrain and the other ALMAZA, one of the old foundation mares from the Jordanian Stud. Almaza later returned to Jordan as they wanted to preserve her bloodlines. 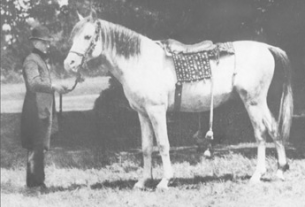 Both mares produced colts when bred to the Maxwell’s stallion Ghadames, which were sold. The remaining mare, Rajha was sent to Donax. She produced a colt foal which was also sold. Her next foal was by SAAMIH, a young stallion that Susan owned. The filly, named SAABIRAH, was not what Susan liked so she stopped breeding the mare. Saabirah, however, is a very powerful mover, probably the best mover Susan owns. Rajha died in 1999, aged 29. 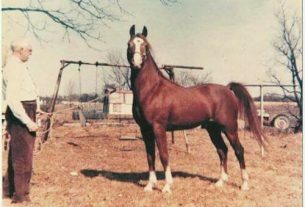 In 1987 she leased, and was subsequently given, SUBAIHA (Akram x Somersault), a 1969 mare of old English breeding with foal at foot by Ibn Morafic (Shams El Farin by Farouk x Tahiti, a mare with Rithan, Rissalix lines). She purchased the foal, BINT IBN MORAFIC and showed her very successfully in hand and under saddle gaining many championships. Bint Ibn Morafic subsequently was sent to the straight Egyptian stallion, M.A. Alishah and produced a very typy colt that was sold. Subaiha returned to Ibn Morafic and this time produced a filly, Summer Fire, who was sold to France. 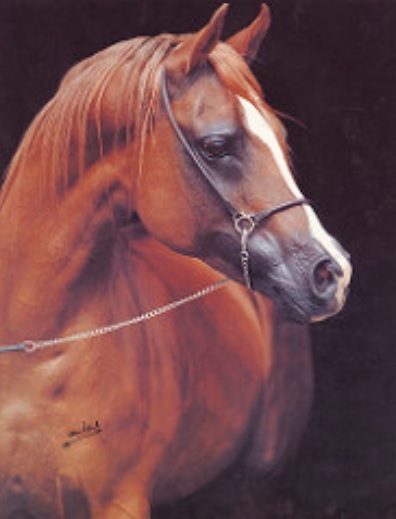 Susan sent Subaiha to Imad producing the 1992 chestnut mare SUMADI, who again had a successful show career. Sumadi was away to be bred when I visited so I did not see her. Based on the quality of Sumadi, Susan wanted to buy a colt by Imad. This colt was SORRENTO who arrived on the farm as a 9 month old foal. He was foaled in 1994 bred by Diana Whittome (owner of Imad) and out of the mare Sarafina, whose dam is the famous broodmare of champions Tarentella (Indian King x Dancing Sunlight) and whose sire is Rodanieh Silver Sarafan, a Silver Flame son from a Russian bred mare. Susan hoped he was going to be a star. Sorrento (Imad x Sarafina), Sweet photo. Sorrento, a beautiful liver chestnut, orange-maned stallion has all the qualities she admires: huge eye, good front, good limbs and moving ‘oomph’ as she puts it. He can move! Sorrento has been campaigned in halter classes and done extremely well. Among his wins are: International Junior Male Reserve Champion at UK International (Towerlands), NE Region Junior Male Champion, Wales and West Junior Male Champion, all in his 2 year old year. He has been shown by Ryan Jones, a professional handler and by Susan when the arenas are small! 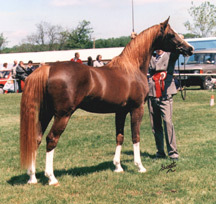 In 2000 at the Royal Welsh Show, Sorrento won his class and became Arab Champion. Not only is this stallion correct, and beautiful, but he has top form movement which enthralls all who watch him! After my visit Susan sent him to be saddle trained and due to his amazing temperament, the prescribed three month training session took him only 3 weeks! He caught on so well, I would not be surprised if he, too, makes a mark in the ridden classes as has his incredible sire, Imad. Sorrento’s half-sister Sumadi was sent to Ffatal Attraction (Sanadik el Shaklan x Falling in Love by Kaiyoum) to produce INFFANTA, her 1997 grey mare. Inffanta is a beautiful young mare, tall and stylish, a mare of halter quality. Sumadi has been sent to Ansata El Salam for a 2001 foal. Susan also owns a 11 year old chestnut stallion ALICANTI (Donax x Easter Silver by Silver Flame). She has not used him at stud however he is the type of horse that would make an excellent endurance sire. He has a beautiful head and eye, nice set up neck of good length, good withers and is tall. Rani 19 year old grey mare (unknown breeding but beautiful) covered by Sorrento this year but lost foal. Nala (Avazi x Pearl Queen) 1998 grey filly.